Transferring Innovation for Maritime Economy (TIME) is an INTERREG IVA project supported by the European Regional Development Fund operating across the geographical regions of Nord-Pas de Calais, Flanders and South East England. Twenty-seven delegates from France, Belgium and the UK gathered in Ostend at one of the recent TIME project's workshops to hear how Serious Games technology could be used to improve safety and productivity in the European port and shipping industries (find also SEAGITAL: Serious Games For The Marine Sector). Hosted at the Andromeda Hotel in Ostend, speakers from France, Belgium and the United Kingdom inspired attendees with the latest developments, application of new technologies and examples of the opportunities that are available for companies looking to enhance their position and work collaboratively across the international borders. Experts spoke about how Serious Games technology is being utilized to help industry perform more efficiently and how emergency services are able to simulate life threatening situations to improve the training of their staff. Elise Van Marcke of Antwerp-based Sakari Games opened the workshop with a detailed overview of the Serious Game industry and the impact it can have on both consumer and business markets. Jérome Poulain of French communications agency Audace illustrated the use of 3D computer animation across the shipping and ports sector and was followed by Maxence Devoghelaere from gaming agency 3D duo, who demonstrated their development skills and explained how creation and design has moved forward in the industry. The Serious Games presentations stimulated high levels of discussion amongst the delegates and Jacqueline Cawston from Coventry University’s Serious Games Institute in the UK demonstrated some of the latest technology during her address, unveiling cutting-edge gadgetry such as handheld applications designed for identifying weapons and threats. "Serious Games" technology is used to mirror real-life situations, enabling trainees to respond to the situation as it develops. As with ordinary gaming the complexity of the situation increases in line with their skill levels and they are encouraged in a non-threatening manner to progress to higher levels of efficiency. Richard Barron, of UK project partner, Marine South East commented, "This is a really exciting development and will we believe revolutionize training in ports and marine related operations. The ability to bring European companies together through the TIME project has helped facilitate the process of sharing ideas and encouraging collaborations that will benefit individual businesses as well as the ports industry as a whole." The TIME project, funded through Europe's Interreg iva 2 Seas program, illustrates the power and effectiveness of cross-border collaboration and the opportunities that are available for businesses operating in the maritime sector. Formed with the aim of improving the development of sustainable, innovative products and services by encouraging enterprises in the regions of Nord-Pas de Calais, Flanders and South East England to collaborate and work together, the TIME project has been looking at opportunities in the Port Security and Logistics sector. 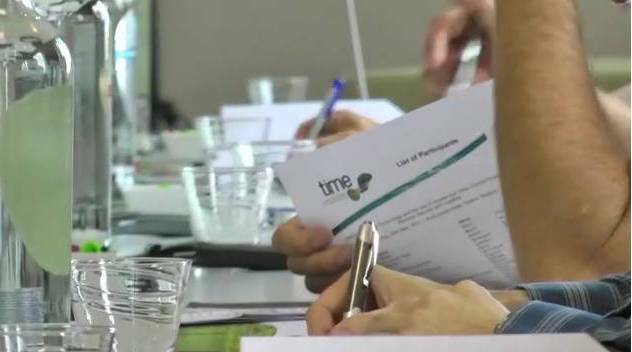 Planned outcomes of the TIME project include helping small to medium sized marine enterprises in the participating European regions to network and collaborate creating new opportunities to bring products to market faster and more easily. Companies, knowledge institutions or individuals involved in the development of innovative products or services that would like to become involved in the TIME project are encouraged to contact their regional partner representatives.